The term Taiwan yuan jhu min (Taiwan's indigenous peoples) refers to those ethnic groups inhabiting Taiwan and its neighboring islands before mass immigration of people from China's coastal areas from the 17th century onward. During the period of Japanese rule, Taiwan's indigenous peoples were designated as either "mountain savages" or "plains savages." As of November 2005, the 12 Taiwan indigenous groups recognized by the government have a combined population of approximately 464,000, representing about 2 percent of Taiwan's total population. According to linguistic analysis, Taiwan's indigenous peoples belong to the Asutronesian (Malayo-Polynesian) group, which inhabits an area of oceans and islands that extends from Easter Island in the east to Madagascar in the west, and from New Zealand in the south to Taiwan in the north. Anthropological research has shown that cultural customs of Taiwan's indigenous groups, such as stilt houses (buildings raised above the ground to protect against damp, insects, and snakes), slash-and-burn cultivation, bamboo and rattan weaving, manufacture of clothing from animal hides, tattooing, chewing of betel nut, and circle-dancing, all belong to traditional Austronesian culture. Due to the number and diversity of indigenous languages in Taiwan, some scholars have suggested recently that Taiwan may be the original homeland from which the Austronesian peoples began their diaspora several thousand years ago. In comparison with inhabitants of other Austronesian regions who have been exposed to outside cultural influences such as Islam and Christianity, Taiwan's indigenous peoples have maintained much of their uniquely inherited cultural customs. Aboriginal cultures in Taiwan have been evolving in step with larger social developments. Through contacts and exchanges, the tribe-based cultures and lifestyles of the indigenous people have absorbed extraneous factors and gradually blended with those of other ethnic groups in Taiwan. The outflow of more than 130,000 indigenous people from their original homes into cities has brought new challenges to aboriginal cultures. Taiwan society consists of Han Chinese and Austronesian people who, despite their cultural differences, are able to work together and make their respective contributions to society. Indigenous people's consciousness about the importance of traditional cultures and their actions to revitalize them and pass them on to the next generation, as well as the government's respect for cultural pluralism and willingness to allow room for its development, create the conditions for aboriginal heritages to be sustained in Taiwan. © 2005 ChinatownConnection.com, Houston Chinatown Web Portal. 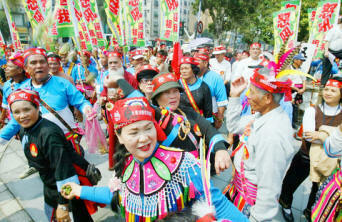 The Culture of Taiwan's Indigenous Peoples. All Rights Reserved.